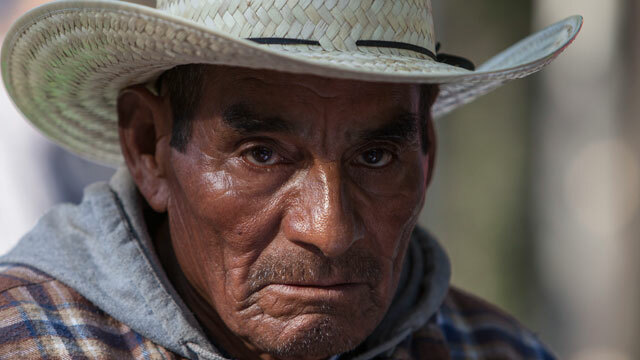 Elderly worker during a protest over compensation for Bracero workers, on January 29 in Mexico City, Mexico. Republicans and business interests want to make sure that any immigration reform bill includes a way for lesser-skilled workers to enter the country legally. Crafting such a system, however, is tricky. Guest-worker programs have a history of labor abuses, and any new program will need to offer guarantees to combat those worries among organized labor and Democratic lawmakers. So far, business and labor interests, represented by the U.S. Chamber of Commerce and the AFL-CIO, have come to a basic agreement on a new visa for lesser-skilled workers. Both sides have stressed that the proposed visa wouldn't amount to another guest-worker program, since it would offer an eventual route to permanent legal status. To combat a shortage of workers during World War II, Congress approved a deal with the Mexican government to bring temporary agricultural workers to the U.S. The Bracero program started small but eventually grew to bring more than 400,000 workers per year to the U.S.
On paper, the program had strong labor protections, but, often, those safeguards weren't carried out in practice, according to Cindy Hahamovitch, a professor at The College of William & Mary who studies guest-worker programs. For example, employers were required to provide housing for the temporary workers, but the living quarters were often substandard. "You had men sleeping in stables and chicken coops," Hahamovitch said. Investigations by labor organizers found that workers were victims of wage abuses, as well. Amid loud opposition from labor groups, the program was ended in 1964. During the same post-war period that saw the start of the Bracero program, the sugar-cane industry in Florida began turning to temporary workers for harvests. Most of those workers came from Jamaica through what is known as the H-2B guest worker program. Each season, it was common for workers initiate short labor stoppages to bargain for better pay. But employers held the cards: workers could be summarily returned to their home country and easily replaced, according to Hahamovitch. One incident stands out, however. In November 1986, sugar cane workers in Okeelanta, Florida went on strike, and a local sheriff intervened. Hahamovitch recounts the incident in the book "No Man's Land: Jamaican Guestworkers in America and the Global History of Deportable Labor." After a day of striking, the camp was raided by police, who cleared the barracks with their guns drawn. During the raid, two Jamaican workers were bitten by dogs, but police claimed that those workers had been resisting arrest and attempting to incite a riot. The involvement of local law enforcement wasn't too unusual, but should have raised questions, Hahamovitch said. "It's not supposed to be illegal to strike," she said, "so why is the sheriff being called in to break a strike, and using police dogs and helicopters?" The sheriff's office told a different story, saying that the police came because strikers had locked a farm superintendent in his office and tried to burn down a cane field. But Hahamovitch cites police documents that indicate authorities were responding to the strike. After the raid, roughly 350 workers were rounded up and brought to the airport by local police before they could even pack their belongings or change their clothes. "Some of them were in their work clothes, some of them were in their underwear and slippers," she said. Because employers had the power to terminate an employee's contract and repatriate him or her immediately, the temporary workers had little recourse to fight the removals. However, a small group of men present on the day of the raid did stay in the U.S., and joined multiple lawsuits. The farm in question was owned by the Flo-Sun company, the country's biggest sugar producer. In the weeks following the strike, the owners did not comment. After Hurricane Katrina, a marine oil-rig company looked to Indian guest workers to help repair offshore rigs damaged in the storm. The Alabama-based company, Signal International, hired approximately 500 metal workers on H-2B visas in 2006 and 2007. After coming to the U.S., the workers said that they were recruited under the impression that would be eligible for legal permanent residency through their work. Some workers claimed they had paid exorbitant sums -- upwards of $24,000 -- for the visas. When the workers learned that H-2B visas didn't lead to permanent legal status, many sought legal help, also claiming that workers had been abused at Signal. Both the Department of Justice and the Department of Homeland Security opened investigations into claims that the workers faced discrimination and a work environment "laced with ridicule and harassment," The New York Times reported in 2010. Signal denied the claims, saying that the Indian workers were treated fairly, and that the recruiters who deceived the workers into thinking they would get green cards were not company employees. Mr. Schnoor said the "direction" he received from an immigration enforcement agent was this: "Don't give them any advance notice. Take them all out of the line on the way to work; get their personal belongings; get them in a van, and get their tickets, and get them to the airport, and send them back to India." ICE declined to comment this week on the investigation, and the Justice Department did not respond to a request for comment. In an internal e-mail message 10 days later, Mr. Snyder reported that another immigration official had assured him in a meeting that day that the agency would pursue any Indian workers who left their jobs, "if for no other reason than to send a message to the remaining workers that it is not in their best interests to try and 'push' the system." Back in 2010, Brian Hale, an ICE spokesperson, said that even if a company has fired workers employed through the H-2B program, the company "is prohibited from compelling individuals to get on the plane." Although a federal judge denied a petition for a class-action lawsuit in 2012, workers involved in the dispute are still pursuing individual cases, according to an attorney from the American Civil Liberties Union (ACLU), which is representing some of the men. +Why Do Farmers Get Their Own Immigration Deal?